It's often been said that being social is, as a species, our most defining characteristic. We work and play in groups so we can talk, listen, collaborate, interact, and ultimately accomplish something. These days, collaborating with colleagues can be a real challenge. You have various conversations happening all the time, a multitude of files stored in various places, and countless meetings to co-ordinate and keep track of. People need to be able to get together quickly in order to organize into a team and get stuff done. Members of a group know and trust each other, converse, and share reports and files. The new groups in Office 365 can make this all a breeze. Groups not only allow you to collaborate but also extensively increase productivity and efficiency. So what is a group? A group is a shared work space for email conversations, files, calendar events, and more where group members can conveniently collaborate and find the important stuff in a sea of noise. Groups enable your company to work like a regular old offline network by simplifying the collaboration process and by connecting you to the people, information, and tools you need. Creating a group or joining one that already exists is very easy, but keep in mind that groups are public by default, so while you can connect right away without waiting for permission, anybody else in your organization can as well. (You can also set up private groups, but this is a one-time only option; once you've selected a group's visibility, it can't be changed.) Each group features an inbox to keep everyone in the loop on all the latest discussions, as well as a dedicated calendar and document repository. Once you've subscribed to a group you can take part in any of its discussions from your own Office 365 inbox. When there is a need to meet, group calendars make it a seamless process. Any group member can create or update events to keep the team involved, even if a group manager isn't available. To track group events, just add them to your personal calendar or display the group calendar next to your own. Because collaboration usually involves working on content, file sharing is essential. One click is all it takes to upload files to OneDrive for Business and grant group members permissions to use them. You can edit or co-author from Outlook web app using Office online. As you work, the side-by-side conversation lets you discuss the changes without leaving the context of your inbox or document. When you're finished, groups automatically makes the latest version available to every member. You can even take your team with you on the road since groups are mobile- and touch-friendly so you can stay on top of conversations, events, and content from any device. Microsoft offers a range of email collaboration tools including distribution lists, site mailboxes, and shared mailboxes. Each of these options has a different purpose, user experience, and feature set. It can be a little overwhelming to decide which tool is right for you, so here is a brief outline to help you decide which is appropriate for your business. Group: A shared workspace that works across all applications in Office 365. This includes a shared inbox, calendar, and OneDrive for Business site for storing files. Users can create, find, and join Groups right from their email or calendar. New and existing users with an Exchange Online or Office 365 subscription can use Groups. Shared mailbox: A mailbox for select users to read and send email messages and share a common calendar. Shared mailboxes can serve as a generic email address (such as info@companyname.com or sales@companyname.com) that customers can use to inquire about your company. When the 'Send As' permission is enabled on the shared mailbox, email sent from the mailbox will use the generic address (sales@companyname.com). Distribution list: A distribution list is used distribute email messages to two or more people at the same time. Distribution lists are also known as mail-enabled distribution groups. A variant of the distribution group, called the dynamic distribution group, is a mail-enabled Active Directory group object used to send email to a large and evolving group of recipients. The exact recipients are determined by filters and conditions that you specify, such as all members of a particular region or full-time employees. Site mailbox: A site mailbox includes SharePoint Online site membership (owners and members) and shared storage through an Exchange mailbox for email messages. A site mailbox brings Exchange email and SharePoint documents together. It serves as a central filing cabinet for the project, providing a place to file project email and documents that can be accessed and edited only by site members. In addition, site mailboxes can have a specified lifecycle and are optimized to be used for projects that have set start and end dates. These tools are designed to help teams collaborate effortlessly, however groups can be used to replace shared mailboxes or SharePoint sites in some instances. Site mailboxes have project documents that are stored on a SharePoint Online site and team members send and receive project related email via the site mailbox. Shared mailboxes are used by users who delegate working on behalf of a virtual identity (e.g. support@companyname.com) and respond to email as that shared mailbox identity. Finally, Groups are generally used by users who want a collaboration workspace for their group messages, files, and calendar that is integrated with the Office 365 services that they already use. 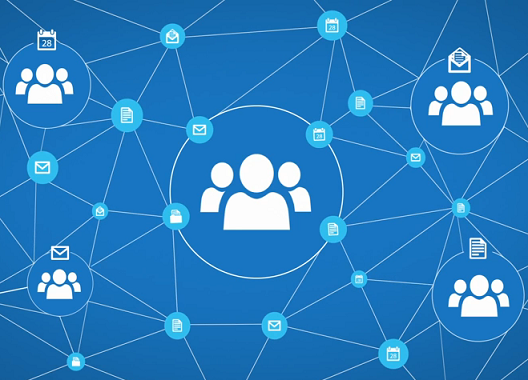 Office 365 groups is part of the first phase of Microsoft's plan to integrate Enterprise social features across platforms, including Yammer, Lync (Skype for Business), SharePoint, and Exchange Online. Office 365 Groups is the tool to use if your organization does not need a full-fledged social network experience. Groups makes more sense because it's a great alternative to public folders and distribution groups which are normally the go-to tools used for collaboration and collective productivity.